ForeScout Technologies, Inc., a pioneer in agentless cybersecurity, today announced the findings of its new “European Perceptions, Preparedness and Strategies for IoT Security” survey. ForeScout commissioned Quocirca to conduct the “European Perceptions, Preparedness and Strategies for IoT Security” survey from August – September 2016. 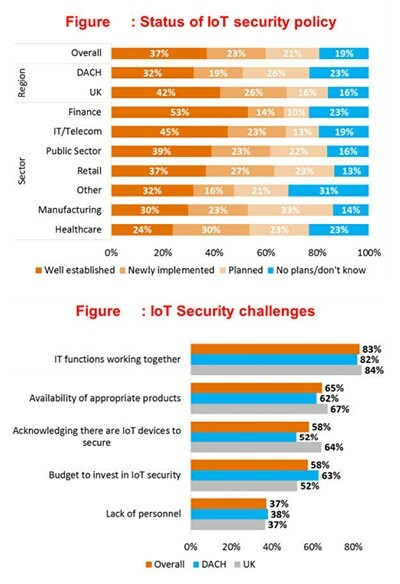 The survey of 201 senior IT decision makers in the UK and German speaking regions of Germany, Austria and Switzerland (‘DACH’) analysed and assessed respondents’ views on their organisation’s IoT devices, security policies, approaches and tools. The research covered a range of industry sectors and businesses with as few as 10 employees, up to large enterprises with more than 10,000 employees. The research follows on from an earlier survey carried out in the U.S. by Webtorials in March – April 2016.